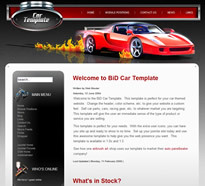 Beauty in Design have released a theme all about cars - which will be handy if you're looking for a theme about cars. It's not really all about cars - but that's how its been set up - it's basically got a big car as the logo but if you put a boat up, it would be about boats. However it does have ten module variations pre-installed, all car related, so it's got added functionality too. You can see a demo here and get more information in what you need to do to sign up. A very closely linked company have also released a theme for the iPhone. It's all very nice and you can get more information here.